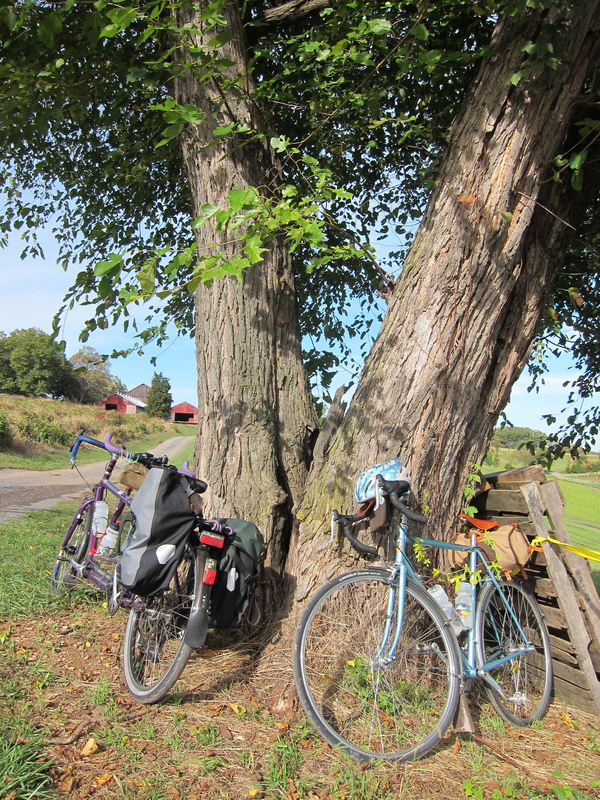 We sort of interrupt the Coffeeneuring Challenge for a couple of ride reports. 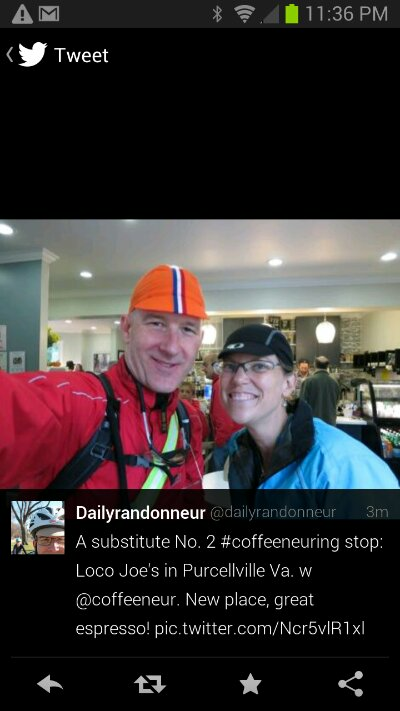 I say sort of because Sunday’s ride included coffeeneuring. 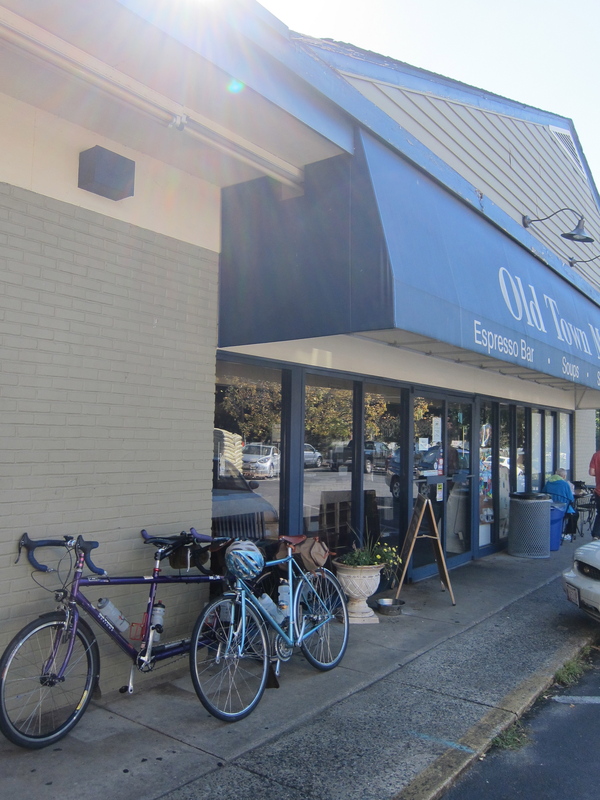 My 87-mile Tuesday Fun-Odyssey also included coffeeneuring, but my documentation is questionable thus, did the coffeeneuring even happen? You tell me. 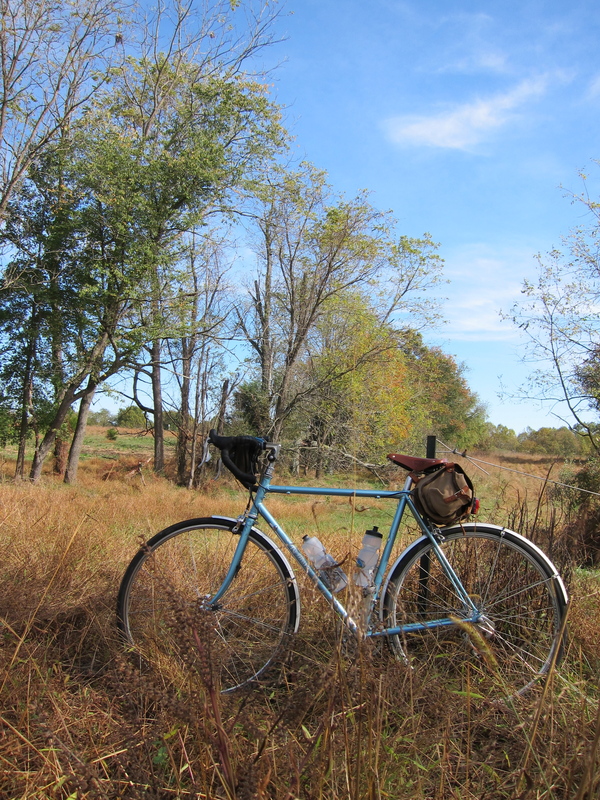 This weekend Felkerino and I craved an escape from the city so we ventured out to do a century in horse country Virginia. It was a rainy drizzly day, not what you would call inviting. Even so, we agreed it was better than spending the day in Washington, D.C. Felkerino added that it takes a rainy ride every once in a while to renew our appreciation for the sunny ones. 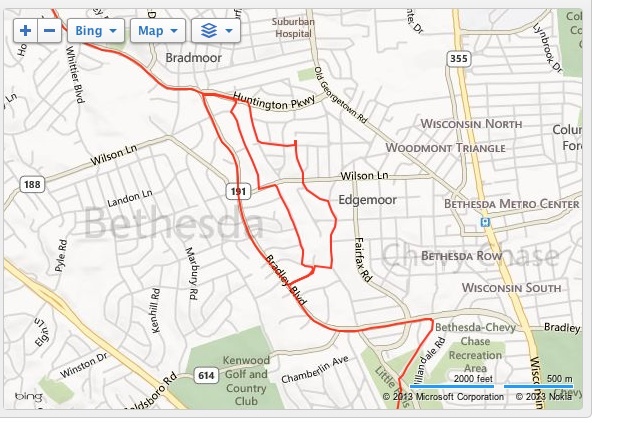 Our route started in Warrenton, wound us through Middleburg at 32 miles, rolled us over to Purcellville at around mile 58, took us through Marshall at mile 76, and returned on what felt like pretty hilly stuff back to Warrenton. Ta dahhh! Because of the weather as well as our route selection, the roads were nice and quiet. Leaves were turning, but because it was so dark for most of the day, it was hard to get the full effect of the changing colors. 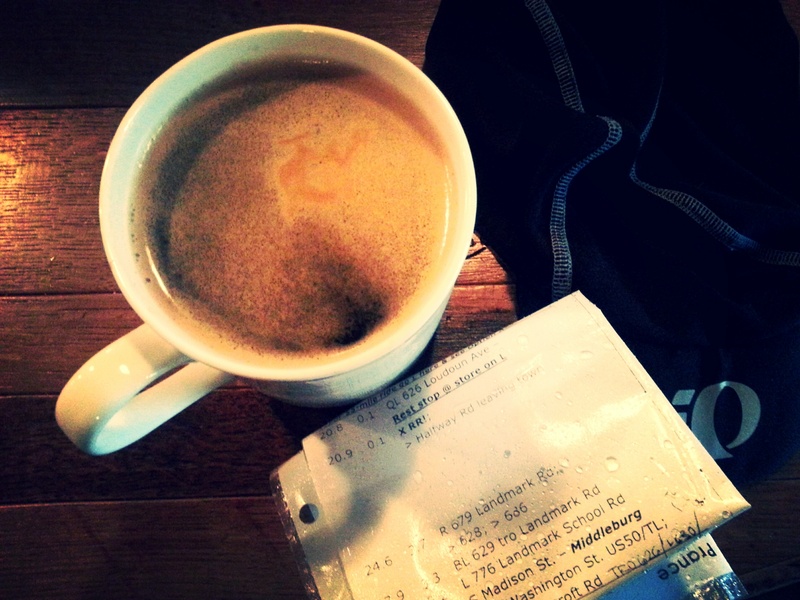 We made sure to work in a coffeeneuring stop on our ride. We planned to coffeeneur in Middleburg at the shop there. I think it’s called Common Grounds. It was alright. Felkerino believes they are not using good fresh beans. I’m not picky, especially on rainy days, so I thought my Americano was just fine. In Purcellville, we were leaving town when I noticed a shop I had seen in Classic Three Speed‘s coffeeneuring write-up called LoCo Joe. Man, that place makes some good espresso. 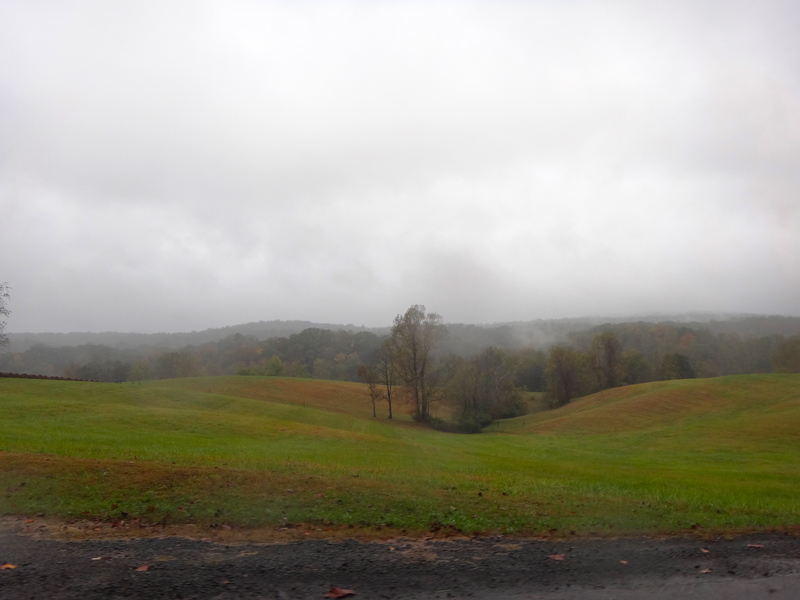 Felkerino and I left Purcellville in high spirits despite the rainy conditions. Monday evening my friend Mike pinged me to see if I was up for a Fun-Odyssey with Lisa and him to Butler’s Orchard in Germantown, Maryland. The forecast was a 10 out of 10, so combine that with the assuredness of good company and it was an offer I could not refuse. If you know Mike at all, you know that any rides you do with him will be an adventure. Ours certainly was, and in the best way. Would you accept this photo as evidence of coffeeneuring?? Hilarious! I was used to people telling us lies about sweet treats (You deserve it!, You earned it!, etc.) so the woman’s frankness was refreshing. We devoured our fattening muffins– mine was pumpkin cheesecake and Mike’s was a doughnut muffin (! 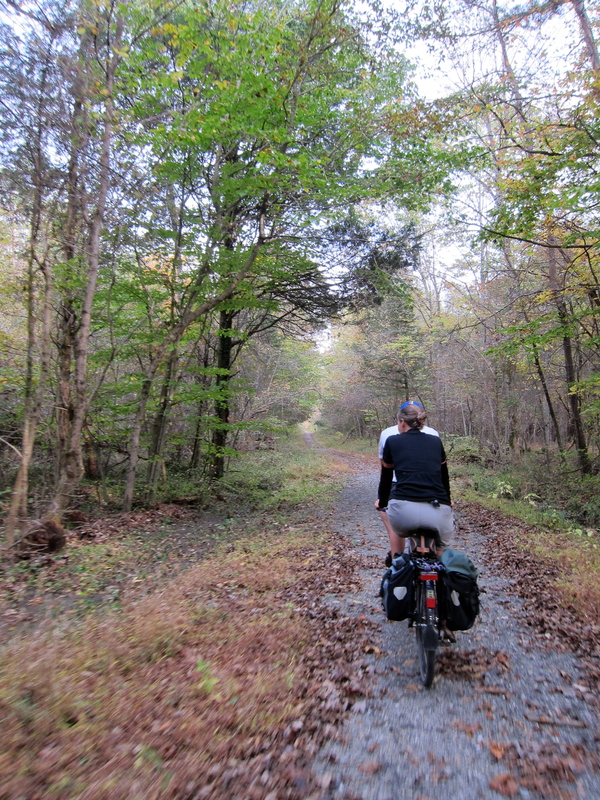 )– and made our way over and through the dump (no, I am not kidding; we rode through the dump! ), Rockville, and out to Germantown, Maryland. The farther out we explored the more incredible the fall color. The weather was delightful, with the lightest of winds and temperatures that hovered around 70. 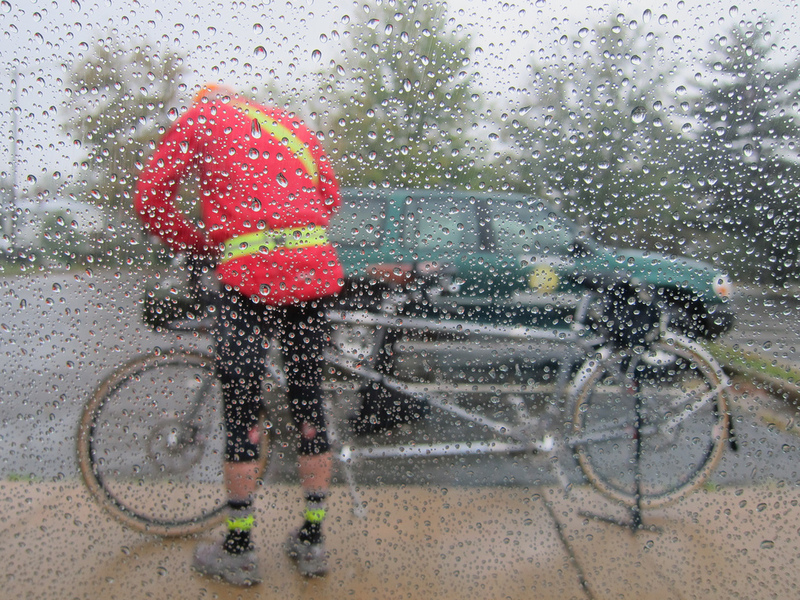 Thank goodness I rode that rainy century with Felkerino, as it made me savor every mile of our fun-odyssey. Butler’s Orchard was quite scenic. After you enter the orchard you have to climb up to a little ridge to the pick-your-own produce and orchard areas. 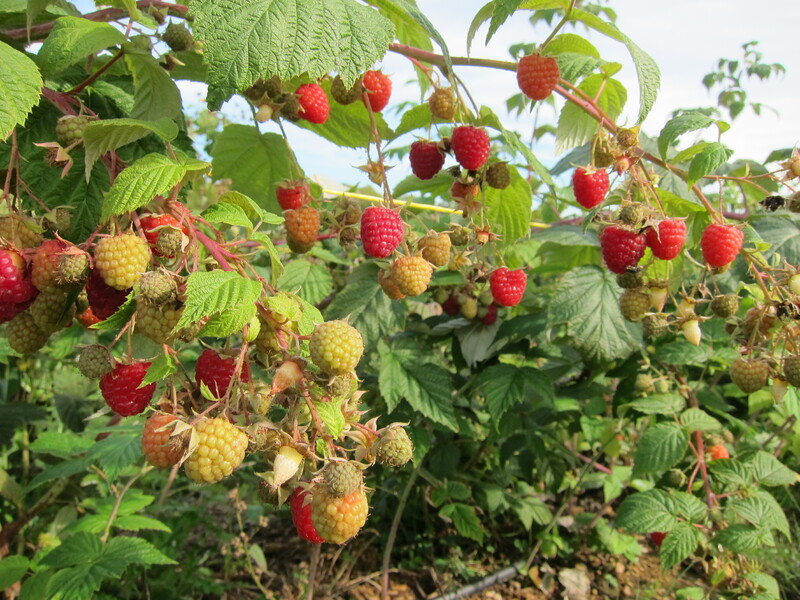 Lisa and Mike had their hearts set on red raspberries. I always thought that was an early summer fruit, but somehow this orchard had some late-peaking plants. 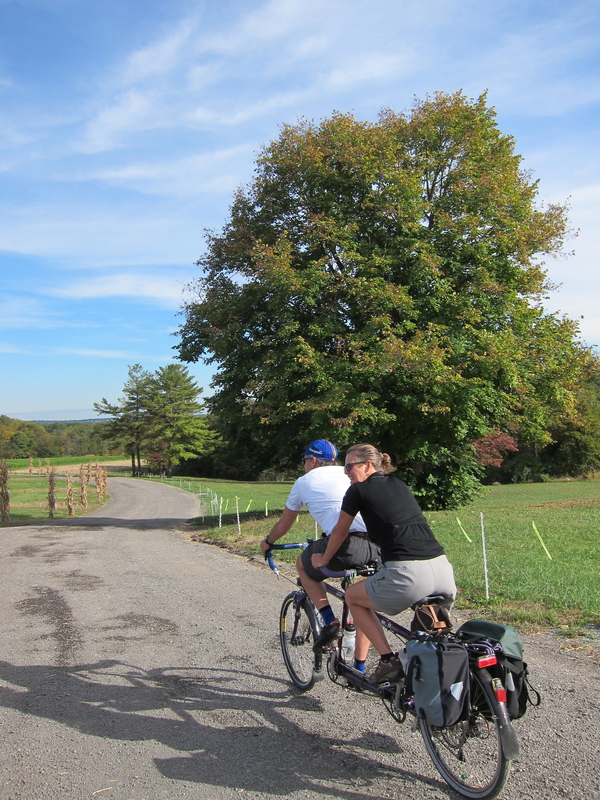 After Butler’s Orchard, Mike directed us through mostly quiet roads (no more dumps, yay!) and we meandered through Black Hill Regional Park. We then entered Hoyles Mill, which required some gravel grinding and use of my technical skillz, such as they are. 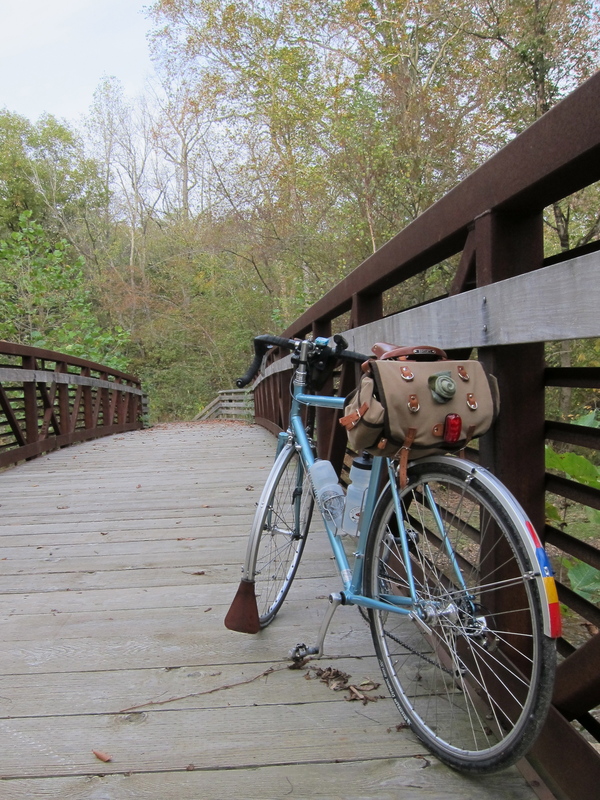 My Rivendell Romulus responded beautifully, and the area was eye-poppingly awesome. I had never visited this area of Maryland before. I was impressed with how Mike threaded our route together. We rode from the city and yet, so much of our route seemed removed from the urban craziness. Later we made our way over to Bethesda. Mike said he knew a shortcut, but in reality all we did was look at big houses and return to where we started our shortcut from. Longcut! No matter. 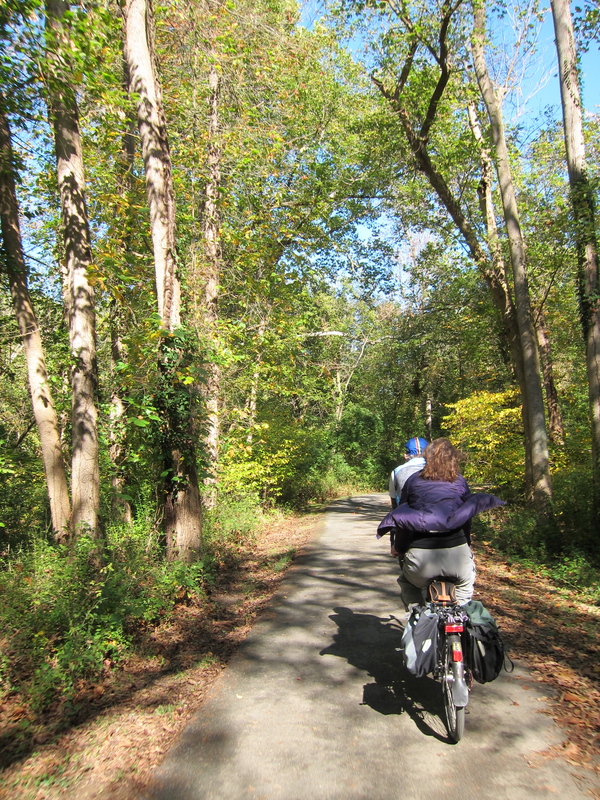 Our lights held strong and we carried on to the Capital Crescent Trail and flew into town. We parted ways and I headed back home while they made their way out to dinner. When I walked in my front door, my computer read 87 miles. It was a truly sublime day of shared laughs and oohs and ahhs about the fall color and vistas (excluding the dump, of course). I love the fleeting beauty of fall, and I revel in a good day spent on a perfect fall fun-odyssey with friends. And yes, a rainy day ride sure helps you appreciate those sunny ones. I agree with that comment, in spades! A doughnut muffin and a dump. Mike never ceases to amaze me. 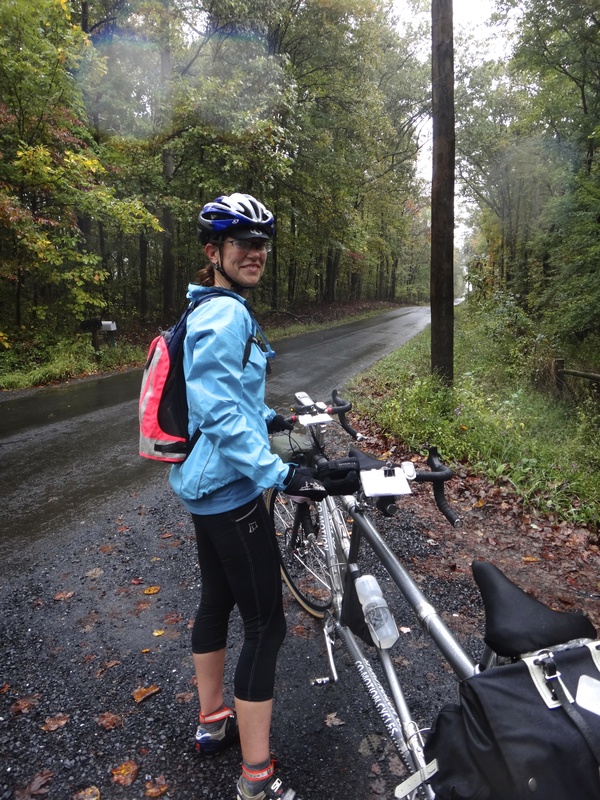 Glad to see you didn’t let the rain keep you in, and the MD ramble looks like it was awesome. The Romulus looks fantastic! Well….. I had to enlarge the photos to make sure the coffee shops would qualify. (-: I’d count them! Yeah! Thank you for your external verification! 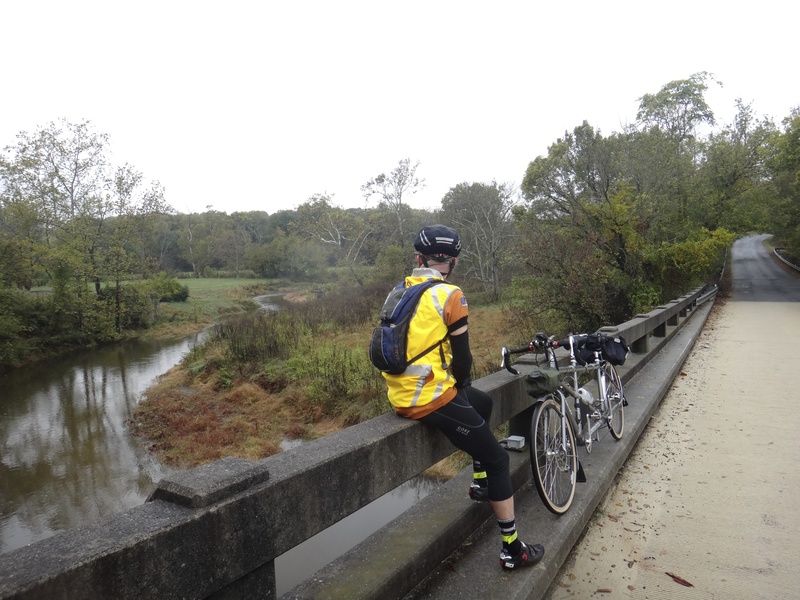 These were great ways to lift your spirits during the shutdown but the rainy day ride would test me perhaps too much. It’s great that you and Felkerino can deal with those conditions. Yes,on the coffee test. But who am I to decide? Just read the news, no more shutdown. Hopefully this will be the last one for a while. I experienced the 1995 shutdown, which no doesn’t seem to have any place in my memory but I know I was working for the the federal government then. Hopefully these rides will be your memory of this shutdown. I’d allow that as a coffee ride. I miss rides with Mike. Enriching and edifying in every respect. Lucky you!